It is our vision to inspire, motivate and guide every individual that trains with us to a higher level. Our experience can help you reach your goals! Self Perfection, Self Protection, Weight Loss, Toning, Cardiovascular Training, Coaching for Competitive Fighting, Building Confidence inside and outside of the Ring! One-on-One training is available, along with small group classes, privates lessons, and options for international students visiting the Fort Lauderdale, Miami, West Palm Beach and greater South Florida area. 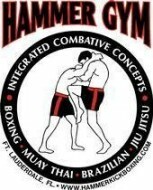 Call or email today for more details, or to schedule a visit to the HAMMER KICKBOXING ACADEMY gym. New Location – Tribal Gym!!! Private instruction available 6 days a week — Call for appointment. NO GROUP CLASSES/PRIVATE INSTRUCTION AVAILABLE BY APPT. Tuesday 640pm-740pm Boxing&Muay thai kickboxing(Group) Private training by appt only. Thursday 640pm-745pm Boxing&Muay Thai Kickboxing(All Levels)Pad Work&Sparring. 1145am-1pm Boxing&Muay Thai Kickboxing Fundamentals(All Levels Group)Private training available by appt only. NO GROUP CLASSES/PRIVATE TRAINING AVAILABLE BY APPT.